The Cassina Refuge Tonneau is a cozy mountain shelter designed by Charlotte Perriand and Pierre Jeanneret in 1938. 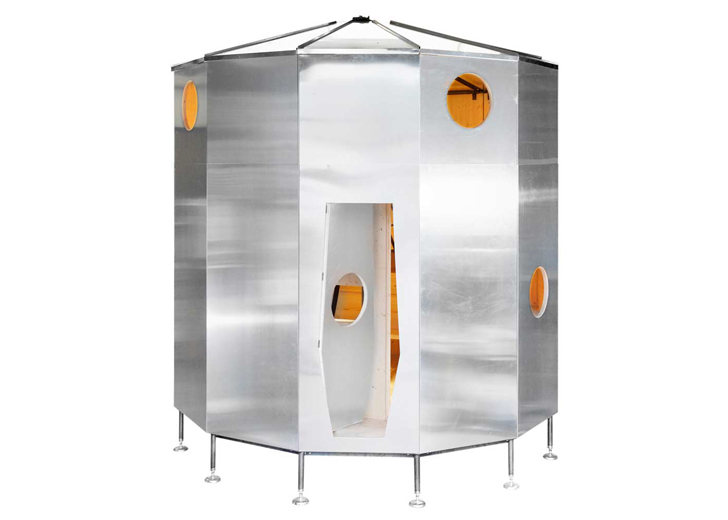 The futurist spaceship-like structure was inspired by children’s fairground rides: Perriand conceived the shelter as a metal shell with a central pole, similar to a carousel. The shelter has a dodecahedron structure which was ahead of its times and was used in the Antarctic in 2002 and at the Mars Society Desert Research Station in 2011. The structure is lightweight and easy to assemble. Although it might look uninviting from the outside, the shelter’s interior looks like a cozy mountain log cabin. The shape was chosen to provide stability on uneven land, while the pinewood interior give warmth and a natural feel to the space. The interior has two single beds on the lower level, a heater positioned inside the central steel pillar, a small kitchen and a shelf for a camping stove and space for food. The single beds are foldable-the designers used the same system as the one found in sleeper cars on trains at that time, and can be used as seating. Like a proper mountain home, the shelter has a rack for skies near the front door and a drip tray underneath it. Looks more like a grain bin than a spaceship to me. The shelter has a dodecahedron structure that was ahead of its time and was used in the Antarctic in 2002 and at the Mars Society Desert Research Station in 2011. The structure is lightweight and easy to assemble. Although it might look uninviting from the outside, the shelter’s interior looks like a cozy mountain log cabin. The shape was chosen to provide stability on uneven land, while the pinewood interior give warmth and a natural feel to the space. 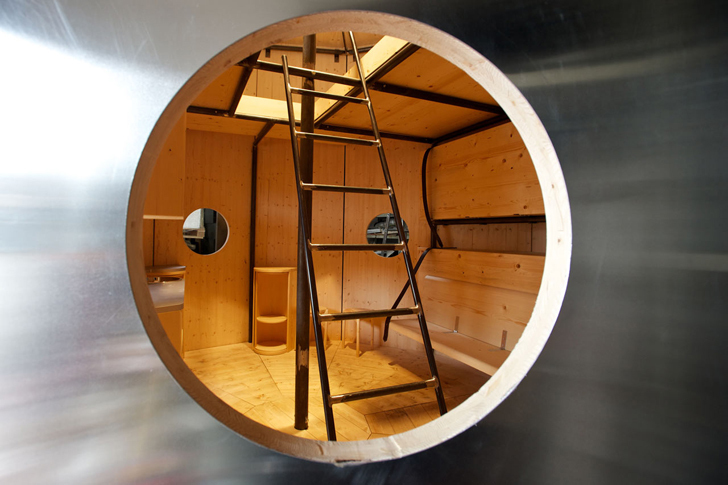 The interior has two single beds on the lower level, a heater positioned inside the central steel pillar, a small kitchen and a shelf for a camping stove and space for food. The single beds are foldable-the designers used the same system as the one found in sleeper cars on trains at that time, and can be used as seating.